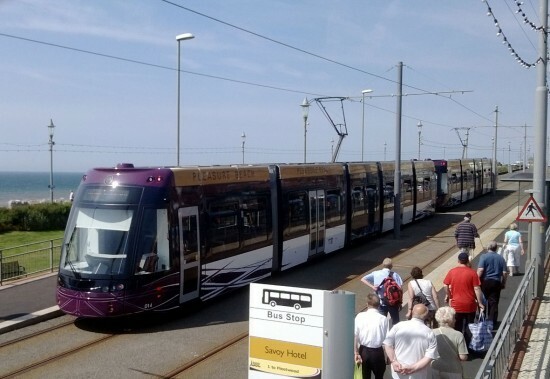 One of the normal reliable Flexity2 trams in Blackpool broke down on Wednesday 17 July which led to the rare sight of two of these Bombardier built trams coupled together as a rescue of the failed tram was made. 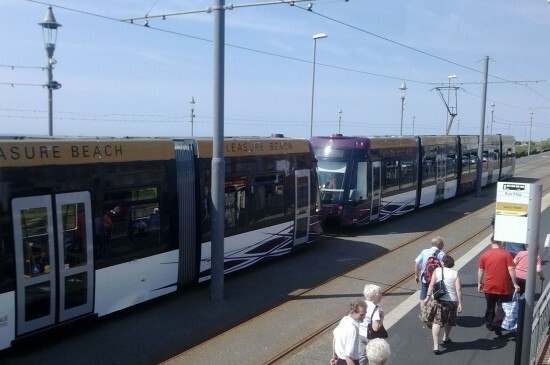 014 was the tram which had failed and 015 was on call to tow it out the way to allow the service on the Blackpool Tramway to be reformed. We are grateful to David Lloyd for providing us some photos of the rescue operation. Taken from the top deck of a bus from the Prom road this first view shows 014 being towed by 015 past Gynn Square tramstop. 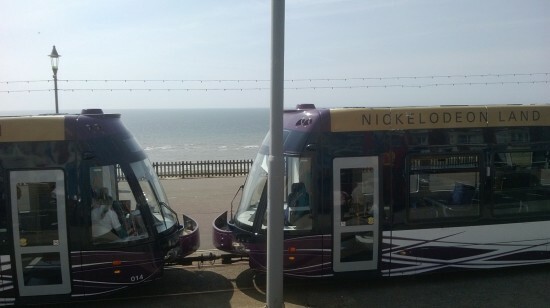 A close-up view of the two trams coupled together. A friend of mine was in Blackpool that day and was completely unimpressed by the hour’s delay that followed, the inability to get aboard the Number One bus, and was asking where was the Unimog to get things moving quickly by getting the disabled unit to a loop. Is this something to do with Bombardier being responsible for the Flexxity fleet and not BTS? BTS vans were in attendance at the Metropole Hotel at about 3pm. I am guessing that 015 failed. 014 was emptied of passengers at North Pier tram stop so that it could push 015 to the Cabin crossover. Both trams still had pantographs raised. Link to my Flickr photos. A tongue in cheek query for the photographer is why was he using the bus instead of the trams?? Shocking. @ Gregory, I was on the ex Hong Kong open top sea front service,ideal for taking photos !